This ca. 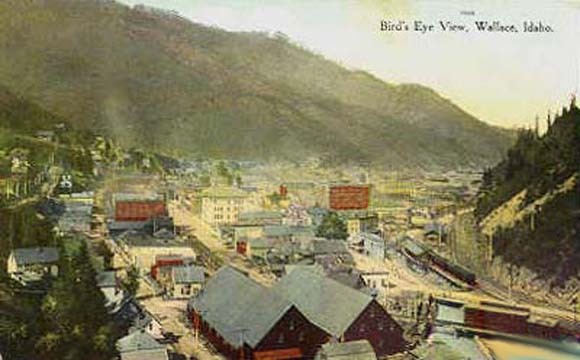 1900 postcard shows Wallace, Idaho, a historic city in northern Idaho and the county seat of Shoshone County in the Silver Valley mining district. The community sits alongside the South Fork of the Coeur d' Alene River and Interstate Highway 90. Wallace is the principal town of the Coeur d'Alene silver-mining district and has produced more silver than any other mining district in the United States since its discovery in 1884. The geology of the Wallace 1:100,000 quadrangle, Idaho was compiled by Reed S. Lewis in 1997 primarily from published materials including 1983 data from Foster, Harrison's unpublished mapping done from 1975 to 1985, Hietenan's 1963, 1967, 1968, and 1984 mapping, Hobbs and others 1965 mapping, and Vance's 1981 mapping, supplemented by eight weeks of field mapping by Reed S. Lewis, Russell F. Burmester, and Mark D. McFaddan in 1997 and 1998. This geologic map information was inked onto a 1:100,000-scale greenline mylar of the topographic base map for input into a geographic information system (GIS). The resulting digital geologic map GIS can be queried in many ways to produce a variety of geologic maps. Digital base map data files (topography, roads, towns, rivers and lakes, etc.) are not included: they may be obtained from a variety of commercial and government sources. This database is not meant to be used or displayed at any scale larger than 1:100,000 (e.g., 1:62,500 or 1:24,000). The map area is located in north Idaho. The primary sources of map data are shown in figure 2 and additional sources are shown in figure 3. This open-file report describes the geologic map units, the methods used to convert the geologic map data into a digital format, the Arc/Info GIS file structures and relationships, and explains how to download the digital files from the U.S. Geological Survey public access World Wide Web site on the Internet. Mapping and compilation was completed by the Idaho Geological Survey under contract with the U.S. Geological Survey (USGS) office in Spokane, Washington. The authors would like to acknowledge the help of the following field assistants: Josh Goodman, Yvonne Issak, Jeremy Johnson and Kevin Myer. Don Winston provided help with our ongoing study of Belt stratigraphy, and Tom Frost assisted with logistical problems and sample collection. Manuscript reviews by Steve Box, Tom Frost, and Brian White are greatly appreciated. We wish to thank Karen S. Bolm of the USGS for reviewing the digital files. Download ReadMe file listing all files available for download (8 kb). Download OF99-390 as a PDF document (696 kb). Download a complete digital data package of this report (18 MB download; 30 MB uncompressed). Download the Metadata file as an ASCII text file (24 kb). Download the Dataset in Arc/Info interchange format as an UNIX compressed and, in some cases, TAR file (391 kb download, 1.8 MB uncompressed). Download Additional Datasets in Arc/Info interchange format as an UNIX compressed TAR file (104 kb download, 2.6 MB uncompressed). Download Additional Files that include AML, graphic, key, symbol set, and text files that are necessary to recreate digital map plates in an UNIX compressed TAR file (40 kb download, 130 kb uncompressed). Download Map Files in HPGL2 and ARC/Info graphics format as an UNIX compressed and, in some cases, TAR files. The map is at a 1:100,000 scale and the sheet size is 30 inches by 42 inches (2.6 MB download, 6.2 MB uncompressed).